Beele Engineering has developed a new range of HE plastic transit sleeves and frames to provide for the reliable and comfortable transit of cables and pipes and to provide for a fire-resistant, gas, smoke and watertight seal. The new transit sleeves and frames form part of the NOFIRNO system technology and can be used in various ways, including in sandwich panels. The HE plastic version enables Beele Engineering to offer solutions that are not only fire safe, but also light-weight. Compared with stainless steel or steel alternatives, the HE plastic version improves working conditions for installers/technicians and makes it possible to achieve substantial savings on transport and storage costs. The transit sleeves and frames are equipped with a separate flange that is attached to the wall of the sandwich panel using NOFIRNO sealant. The transit sleeves come in a standard 300 mm length. The dimensions of the transit frames are 150 x 150 mm and 150 x 300 mm. The system's fire resistance was successfully tested in a min. 100 mm thick wall. The rectangular frames have a 5 mm wall thickness and are also available in a divided version for optimal mounting and installation comfort. In this version, a special NOFIRNO gasket is placed between the separate frame components. After the cables or pipes are put through, the transit frame or the transit sleeve is finished with NOFIRNO sleeves, filler sleeves and sealant. 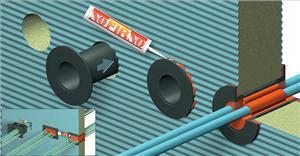 This creates a fully fire resistant and smoke, gas and watertight transit seal. The new modules are being used on a large scale in one of the most complex oil and gas projects of TengizChevroil (TCO) in Kazakhstan.